Khan the leader who has proved his leadership capabilities in the field of cricket, when Pakistan won first and only World cup, in the year 1992. After getting retirement from cricket he laid the foundation of Shaukat Khanum Memorial Cancer Hospital & Research Centre in Lahore. The largest Cancer hospital in Pakistan. After proving his leadership in cricket field, Khan decided to laid the foundation of a political party named as Pakistan Tehrik-e-Insaf (Movement for Justice). His main aim of making this foundation was to bring justice in the lives of Pakistani people through an independent judiciary. His vision is that only free and independent judiciary can bring peace. 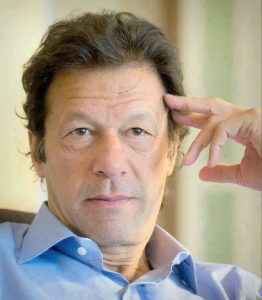 Imran Khan Niazi, born in Lahore, on 25 November 1952, in the family of Ikramullah Khan Niazi, and his wife Shaukat Khanum, as the only son of his parents. The family belonged to the tribe of Niazi Shermankhel. He get his early education at the Cathedral School in Lahore, the Royal Grammar School Worcester in England, where he excelled at cricket, and later at Aitchison College, Lahore. In 1972, he enrolled to study Philosophy, Politics and Economics at Keble College, Oxford, where he graduated with a second-class degree in Politics and a third in Economics. He was the former cricketer of Pakistani cricket team and played for two decades and even he led his teammates to the first and only Cricket World Cup in the year 1992. Before getting retirement from cricket he started his political career and laid founded the political party Pakistan Tahreek-Insaaf (PTI) and became his chairman. He also established a charity Hospital, bearing the name of his mother, named Shaukat Khanam Memorial Cancer Hospital and Research Center in 1996. For this purpose he started a campaign of fund raising all over the world and after such a hard work he was able to laid the foundation of this hospital. He gathered over 25 million donations and funds. On 16 May 1996, he was married to jemima Marcelle Goldsmith, but the marriage of Imran khan could not run long and he divorced Jemima in 2004, because it was difficult for jemema to adapt the life style of Pakistan and Imran Khan could not give time to her from his tough schedule.